“Sv. Dimitrija Solunski” is a Macedonian centre in Markham. The women’s club, folk dance group “Bilyana,” the soccer team, and the Sunday school are its church associations. Nowadays, Canada is regarded as a world example of a multicultural society. Here, alongside with the near one hundred nations from around the world, approximately 150,000 Macedonians from every part of Macedonia have found their place under the Sun. At the same time, for the Macedonians from the Aegean part of Macedonia, Canada is the “real country,” as they call it, where they can express their national, spiritual, and cultural feelings. They were the first and most numerous migrants from Macedonia to come to these rich regions of the North American continent. Unfortunately, Macedonians did not enjoy basic social and human rights in the country where they were born, now within the borders of the Republic of Greece, where the word “democracy” originates from. In Canada, on the other hand, they are equal with the other citizens, they enjoy every social and human right. Here, they are loyal, hardworking, and respected citizens, many of whom economically belong to the wealthier category of citizens. Hence, the Macedonians in Canada represent an important factor in everyday life, and a significant part of the multinational and multiethnic mosaic of this democratic and rich country. The city of Markham is situated to the north of the metropolis, Toronto, at a distance of only twenty kilometres from Scarborough, via Highway 7. Today, however, it is as though these areas have become one. There are new suburbs of houses and various business and factory premises which connect the suburbs of Unionville, Richmond, Stomville, Newmarket, and other places with Toronto. Only the road signs show the boundaries between these settlements which have now become one whole. Markham has more than 150,000 residents of which more than 500 families are of Macedonian descent. They come from the areas of Bitola, Lerin (Florina), Prespa, Thessaloniki, Kostur (Kastoria), Ohrid, and other places. The city is one of the older suburbs of Ontario with characteristic architectural features. This is evident in the architecture of the old buildings in a typically British style, which have mixed with the new modern structures from every part of the world. The central district in particular gives a special character to this modern suburb where many peoples and nations of different religions live. Macedonians are among the more recent migrants in Markham, who fortunately chose this beautiful place to live and work in. They especially began migrating here after 1985, when meetings on a national and spiritual basis were initialised. The Macedonian Orthodox Church of “Sv. Dimitrija Solunski” was established as a result of the numerous activities the Macedonians undertook in the spiritual and cultural field. The annals of the Macedonian Orthodox Church of “Sv. Dimitrija Solunski” from Markham state that initial activities of the Macedonian emigrants, in fact, date back to the 23 January, 1988, the day known as “Vodici.” This was when a group of Macedonians organised the first social evening in the crowded hall “La Rosa,” where the guests were entertained by the Macedonian orchestra “Biser.” From this day on, the activities of the Macedonians from Markham and the surrounding area continued to grow from day to day. Meetings, socializing, and talks were organised, and plans were made for future national and church meetings. Among other activities, in 1989 they also organised a New Year’s party at the “Sheraton” hotel in Markham, where guests were entertained by entertainers from Macedonia. A large amount of money was raised at this all-Macedonian New Year’s Eve with the aim of using it to further enrich their activities. This same evening the Markham Association was established with a number of members. Their activities continued on the 5 March, of the same year, when the first members’ meeting was held at the premises of the “Sv. Kliment Ohridski” church in Toronto, and a decision was reached to register the association under the name of “The Macedonians of Markham.” Here they elected a management committee comprised of distinguished members who invested time and means for the affirmation and attraction of a greater number of members to this new association in Markham. At this time the Macedonians in Markham wished that very soon the association would develop into a church community which would take under its wing every Macedonian, regardless of which part of Macedonia they came from, so that they would belong to their own national, church, spiritual, and cultural institution. As a result of their national and cultural activities, the members of the “Macedonians from Markham” association established a folk dance group, which later got its name “Bilyana.” They opened a Macedonian language school, which offered courses in Macedonian language, national history, geography, and religious instruction. They also founded a soccer team. This led to an increase in cultural, educational, and sports activities, and at the same time, support of the Macedonian organisations and associations in Toronto, such as the “Sv. Kliment Ohridski” church and the “United Macedonians” organisation. To support the Macedonians in Markham these two Macedonian associations organised social evenings, banquets, and other manifestations raising funds for the new Macedonian church. Numerous manifestations of benefit to the church being planned were organised in the next two years. Thus, in February, 1992, the new management decided to purchase the building which had previously been a kindergarten, which was located close to the central city district. They paid $550,000 and turned the kindergarten into a Macedonian orthodox church. This enabled an even larger number of activities and organisation of banquets and different kinds of manifestations where funds were raised for the construction of the new church of “Sv. Dimitrija Solunski.” Banquets at religious holidays such as “Mitrovden,” New Year’s Eve, “Vasilitsa” and other days were organised. 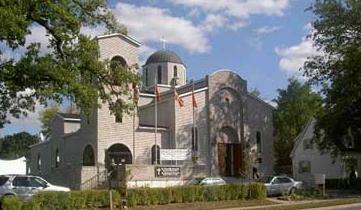 This attracted many Macedonians from the surrounding areas of Markham and Scarborough to become members of the church. It was then decided to pull down the old building and to build a new church in the style of Macedonian architecture. Plans for the new building were in their final stages when metropolitan Kiril visited the community making suggestions as to the appearance and construction of the new church. In addition to this, the Archimandrite Nikodin Tsarknyas’ visit further motivated the Macedonians to organise and carry out their plans as best as possible. It seems that one of the most significant dates for the “Sv. Dimitrija Solunski” church is 15 May, 1994. On this day, the head of the Macedonian orthodox church, g.g. Mihail, together with a large number of priests, in the presence of the Markham Mayor and several hundred Macedonians from Markham and the surrounding area placed and blessed the foundation stone of the new church of “Sv. Dimitrija Solunski.” This manifestation later grew into a church-people’s gathering for many Macedonians and was an opportunity for them to donate for the construction of the new church. It is very interesting to mention that a “live” water was discovered during the construction of the ”Sv. Dimitrija Solunski” church. Many say that they foresaw this before construction of the church began. When metropolitan Kiril saw the water during his visit to Markham, he made the sign of the cross saying that it was holy water which could be drunk or used for good health. The holy water runs continually, and is used by numerous believers. This is the first holy water ever discovered in a Macedonian church on the North American continent. The “Sv. Dimitrija Solunski” church was built in less than a year. Every Macedonian wanted to contribute with funds or effort. This is why the church was built in such a short time. There was tremendous joy at the decision to dedicate the “Sv. Dimitrija Solunski” church in Markham on the 12 May, 1996. This day would be written in gold in the history of the church and the Macedonians from this area. Namely, the head of the Macedonian Orthodox Church at the time, g.g. Mihail, conducted the evangelization of the church, assisted by numerous Macedonian priests from Canada and the USA, in the presence of about one thousand believers, guests and friends of the Macedonians. This was a big victory and achievement for every Macedonian in Markham helped by their friends. This day, in fact, marked the beginning of a new church-people’s life for the Macedonians. The Macedonian church of “Sv. Dimitrija Solunski” in Markham, which was named after his birth town “Solun” (Thessaloniki) and to whom numerous Macedonian churches are devoted, is built of heavy materials and represents beautiful Macedonian architecture. In addition to the church, there is also a church hall and other rooms for baptizing, weddings, and requiems. Regular services and other activities are conducted here, for which the women’s association, which organises breakfast every Sunday for those present, deserves most credit. Established as early as 1991, in the course of these years it has become a right hand to the church management. This women’s association, the folk dance group “Bilyana, ”the soccer team, and other clubs within the “Sv. Dimitrija Solunski” church, alongside with the management, the priest, and its members, are all a constituent part of the everyday life and regular activities of the Macedonians in Markham.